The Jamaican writer Anthony C. Winkler died in September 2015. His death was a personal loss for me in many ways. First of all, I was the person who ‘discovered’ him as a Jamaican novelist: I found his manuscript of The Painted Canoe sitting in a dusty pile when I first started working at Kingston Publishers in 1981, took it home to read that weekend, couldn’t put it down, and on Monday morning (easily) persuaded the publisher, Mike Henry, to offer Winkler a contract. The Painted Canoe was first published in 1983. I would subsequently edit another four manuscripts by Winkler for Kingston Publishers over the next decade, and when he moved to Macmillan I edited another three books of his for that publisher. Meanwhile, in the mid-1990s I decided to do a PhD on Winkler’s work, which I was awarded in 2001; and I converted that thesis into a book which was published in 2006. In all of this, Tony Winkler became my dear friend. In September 2015 when I attended Tony Winkler’s memorial service in Atlanta, I visited the Winklers’ home and was shown Tony’s study by his son Adam; it was overflowing with manuscripts and papers and the family was overwhelmed and unsure what to do with it all. I had been invited by Alison Donnell to a workshop on Caribbean literary archives in Trinidad the previous year, and the thrust of that workshop was the politics of location in relation to diasporic literary archives (see http://www.diasporicarchives.com/trinidad-workshop-review). This was the first event in the region to raise the question of authors’ papers, and it set us all, especially those of us who had personal connections with Caribbean authors, thinking – or at the very least articulating thoughts or reservations which we may have held privately before. It is of concern to some, for example, that V. S. Naipaul’s papers are housed at the University of Tulsa; as are those of Jean Rhys. I was particularly impressed by Ken Ramchand’s recounting of his initiatives in spearheading the acquisition of manuscripts or papers of Wilson Harris, Roger Mais, Eric Roach, Earl Lovelace, Michael Anthony and Sam Selvon, among others, by the University of the West Indies (UWI). Ramchand’s efforts were pioneering – the UWI had never acquired literary archives before; fortunately, these early acquisitions took place before the negotiated price for certain literary archives began to reach dizzying heights. So my main thought when I saw the papers in Tony’s study was, please don’t let Winkler’s papers go to some moneyed US institution! A year later, in October 2016, I participated in the 35th Annual West Indian Literature Conference (held in Montego Bay, Jamaica), whose subject was “Archiving Caribbean Literature and Popular Culture”. That conference stirred up memories of the discussions held in the workshop in Trinidad in 2014. At the end of a session in which librarians from the National Library of Trinidad had related the story of their acquisition of the papers of Guyanese-Trinidadian writer Ian McDonald, I was so inspired by what I had just heard – and so propelled by a conviction generated out of the 2014 workshop – that I impulsively approached a couple Jamaican librarians who were also attending the conference, including the National Library of Jamaica (NLJ)’s executive director Winsome Hudson, and asked them whether their institutions might have any interest in acquiring Winkler’s papers. While other responses were restrained (with good reason – a shortage of storage space), Winsome’s response was enthusiastic and immediate: a resounding YES! Winsome followed up with me aggressively, and I contacted Winkler’s widow Cathy and broached the subject with her tentatively. At first Cathy was hesitant, unsure whether she and her children were ready to part with Tony’s papers; on the other hand, she was certain that if they were to go anywhere, they should go to Jamaica, which was the only place Tony had ever regarded as home. She agreed to have a conversation with Winsome. Winsome also was nervous about approaching Cathy, having never had the experience of acquiring a literary archive before. To my surprise, within a month Winsome called to tell me that she had negotiated successfully with Cathy, and would I be willing to accompany her to Atlanta to go through the papers. On February 4, 2017, Winsome and I flew up to Atlanta. Four days later, we brought home four packed suitcases; in late March two NLJ staff members travelled to Atlanta and brought home another four suitcases; and on April 6, 2017, the archives were officially handed over to the NLJ. Why did I feel passionately that Winkler’s papers should be acquired? First of all, why are the archives of any writer important? They are important to scholars who seek to gain a deeper understanding of the writer’s work. By looking at drafts of manuscripts, or at correspondence, or even at memorabilia, one gets a fuller picture of the writer and of his or her creative process. They are part of a country’s cultural heritage. They are a rich inheritance. The value of literary archives had been brought home to me at that 2014 Trinidad workshop, and it had subsequently been reinforced by my editing of a special issue of Caribbean Quarterly on Caribbean literary archives, compiled by Alison Donnell and containing many of the papers originally presented at the workshop, which we published in 2016 (see http://www.uwi.edu/cq/cq-issues/cq-volume-62-nos.-3-4-(september-december-2016). So, none of this might have happened had I not attended that workshop. 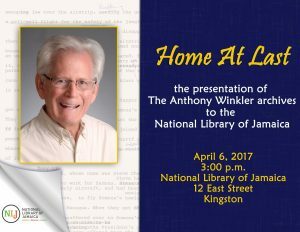 Winkler is famous to most Jamaicans as a writer of comic fiction – principally as the author of The Lunatic, his second novel, and the one which established him as a bestselling novelist in Jamaica. That achievement alone would justify having his archives in the National Library of Jamaica. I have never known of any Jamaican novel to be more popular than The Lunatic. Anyone who has read The Lunatic would of course understand why: it is bawdy, outrageous, side-splittingly funny. Winkler stands alongside other Jamaican fiction/prose writers whose works have formed the Jamaican literary canon: Roger Mais, John Hearne, Neville Dawes, Lorna Goodison, Olive Senior, Kei Miller, Marlon James. The Lunatic is already on its way to becoming a classic in Jamaican fiction. I need to emphasise, though, that Winkler is unique, because in his work he is able to combine outrageous farcical humour with insightful social commentary and incisive analysis of his fellow Jamaicans. Winkler’s books transcend the boundaries between popular and serious fiction. As I stated in my scholarly study of Winkler’s oeuvre, there is a sobriety underlying the farcical humour and a richness underlying seeming superficialities which are often underestimated; there is an artistry in the seamlessness with which these levels coexist; in short, Winkler’s books warrant serious consideration. NLJ’s acquisition of Winkler’s archives will undoubtedly facilitate such consideration. What did Winsome and I encounter in Winkler’s study when we went to Atlanta? • Numerous (100+?) poems of which I had only known of a few (thanks to the initiative of Tony’s daughter Becky Winkler, a number of these will be published soon by the University of Georgia Press). • Some 20-plus playscripts, of which I had only previously known of a couple (including The Burglary, which was mounted in Kingston); and some 4-6 manuscripts of unpublished novels (it is hard to be certain at this point because the papers were scattered – a few pages here, a few pages there, sometimes with pages from one work mixed up in the same pile with pages from another), most of which that I hadn’t known of before. My assumption is that most of those playscripts and novels were written before The Painted Canoe was published in 1983. My impression – though I can’t swear to this since I was getting cross-eyed (as was Winsome) going through mountains of paper in three and a half days – but my impression is that all of these older manuscripts were set in the USA. Winkler stated more than once that he found his creative voice when he started writing about Jamaica: the fisherman who was the protagonist in his early short story “The Man Who Knew the Price of All Fish” (published in 1971) jumped off the page and took over his life. That man grew into Zachariah, the protagonist of The Painted Canoe. After that, there was no holding back Winkler in his churning out of his Jamaican fiction. • There were also fragments of 2 unfinished novels written in recent years – multiple versions. One, Silver Sands, was to be the final part of a trilogy of which God Carlos and Family Mansion had been the first two parts. The other, tentatively titled True Duppy among other names, was a novel Winkler had been struggling with for years. He had expressed to me on numerous occasions – and I am sure his wife Cathy and his children Becky and Adam can confirm this – that he was dissatisfied with his depiction of God, or of man’s relationship with God, in his 1997 novel The Duppy (which is one of my favourite Winkler works) and felt another side of the story had to be told. There were many drafts of this novel. One draft is titled A Walk through Heaven and Hell by Anthony C. Winkler and Horace Brown, with Occasional Interpolations from God Almighty, and in the first line, the first-person narrator asserts, “The writer Anthony C. Winkler is a dirty, stinking liar…. I’m here to tell you that [The Duppy] is all bogus and sham – that every word of that evil book was made up by Winkler.” On the second page the writer states, “My name is Horace Brown, but everyone calls me Dictionary.” My fervent hope is that someone, somehow, in excavating these archives, will come up with a complete manuscript of this novel – I am impatient to get to know Dictionary and find out why he is so outraged by Winkler’s depiction of heaven in The Duppy. In short, I am excited by these archives, and hope to spend very many hours buried in them. I hope many others will also be excited. Winkler’s work deserves greater exposure, and further analysis. The housing of these archives with the NLJ will make this possible. But for me the best part of the acquisition is that it demonstrates how much Jamaica values Winkler’s work. Tony’s biggest ambition was to be recognised in his homeland. His ultimate wish was to return home to ‘Mummy’. He was a treasured friend, and I know how much this would have meant to him. I am happy to have played a small role in enabling that homecoming. Kim Robinson-Walcott, PhD, is editor/head of Caribbean Quarterly, University of the West Indies, Mona. She is also the editor of Jamaica Journal, published by the Institute of Jamaica. Her publications include the scholarly work Out of Order! Anthony Winkler and White West Indian Writing (UWI Press, 2006), Jamaican Art (Kingston Publishers, 1989, 2011) which she co-authored, The How to Be Jamaican Handbook (Jamrite Publications, 1988) which she co-authored and illustrated, and the children’s book Dale’s Mango Tree (Kingston Publishers, 1992), which she also illustrated. Her scholarly articles, book chapters, short stories and poems have been published in a number of journals and anthologies. 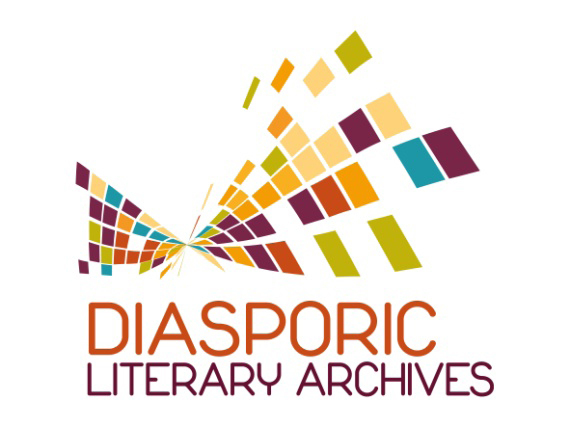 This article first appeared in the News section of the website of our partners in the Diasporic Literary Archives Network. The network has been an ICA-approved project since 2013 (decision of the ICA Programme Commission, Brussels, November 2013).